Laurie's mother, Mrs McAllister, is a sports physiotherapist working with the England cricket team. She's away most of the time, in New Zealand, or Shasakstan (the fictitious state Thompson has invented which has more than a passing resemblance to Pakistan). But it is from her that the novel gets its wonderfully entertaining cricketing theme. We are at the library because there are books here, for props. Because of that anonymity, he seems to require some context. We are in the children's section which is fine with Gee, who says his children's books "do better than the adult books, actually". Just in Case is a cooler, more cerebral novel than How I Live Now, deliberately shorn of the passionate romantic ardour that made Daisy�s tale so attractive, and written in the third person not the first. It is unlikely to gain the huge popular appeal of Rosoff�s debut. Yet in describing the existential anguish of adolescence, and its unique mixture of absurdity and anger, it is a modern The Catcher in the Rye. A few years ago, France's most successful living director announced his intention to quit while he was ahead. He would, he said, make 10 films and then get out of the game. At the time few people took him seriously. But with Angel-A (out this month) and Arthur and the Minimoys (set for release at Christmas), he has reached his limit. PAN MACMILLAN HAS become the latest publisher to enter the manga arena, signing an exclusive sales and distribution deal with Tokyo-based Tokyopop, the US market leader, whose UK turnover is around ?2m. From 1 September, Pan Macmillan will begin sales and distribution of Tokyopop�s huge output � some 250 titles per year � with four Tokyopop staff taking space in Macmillan�s King�s Cross offices. The Child At Heart Gallery in Newburyport, US, celebrates ts fith anniversary this Saturday. The gallery and website 'showcase the art of Children's Book Illustrators - from dazzling original art of Caldecott winners to fine limited edition prints - from classic children's literature to today's picture story books'. Life and Health | Homes and gardens | What would you save if your house was burning down? A friend of mine did an exhibition where he asked artists to bring what they'd take if they had to leave immediately and go into exile. I took my front-door keys. It means you're going to come back some day. He also revealed that he is a fan of Wendy Cope and has a lifesize cadboard cutout of her in hs lounge. The pleasure of reading it derives precisely from its author's obsessive approach, his breathtaking grasp of the oeuvre and the sheer exuberance with which he tackles his subject, showing us just how rich with detail and complexity Herge painted his world. McCarthy's saving grace, though he takes Tintin very seriously indeed, is the humour with which he peppers his analysis and the obvious joy he takes from his area of study, a joy that transcends the critical and stems from the delighted first readings of a child. What Burgess has done here is use journalistic clich?and devices to make the story seem more "real" - less of a smooth read and more of a reporting of events (intercut with sections written by the main characters themselves). The success (or otherwise) of the novel therefore depends on just how gripped you are by the characters and situations. Profile of Frank Cottrell Boyce by Dina Rabinovitch, in which Boyce explains how he was persuaded to write the screenplay for Michael Morpurgo's Kensuke's Kingdom. Somehow or other I missed this stirring piece by Dina Rabinovitch from Saturday's Guardian. Essentially a summer roundup of across-the-age-range recommendations, it leads off with a rousing attack on the anti-readers. Passionate journalism at its very best. Do not miss it! It is one of the many mini-miracles of the great flourishing of children's writing that children's literature should be so strong in a country where the anti-readers hold sway. They are secreted in every crevice of this island. I have interviewed them, so I know. They are in government, in schools, in homes; some of them work in the media. But children's stories flow, none the less, in a huge, rushing tide from the prolific pens of the children's authors, many of whom write two or three really good stories a year. And the children find the books. The story succeeds so brilliantly not through sensationalism but the virtuosity of the style... ...This is a novel for young adults, but is subtle and substantial enough to be read with great pleasure and profit by older adults too. Julia Eccleshare's entry in the Guardian's Culture Vulture blog regarding M Peet's absence from the Carnegie presentation ceremony. News report fom The Guadian on Mal Peet's Carnegie win. Unable to attend the ceremony, Mal Peet wrote an acceptance statement... In it he asserts the value for young people of understanding the past and the continuum of humanity, and warns of the political consequences of disconnection or alienation from the past. Reading, he says, is not only fundamental, but also anti-fundamentalist. Turbulence crackles with excellent one-liners ("women are from Venus, men are from Battersea Dogs' Home, Gran says"), running jokes (Canadians are only dull because they are planning to take over the world, sometimes disguised as Hungarians) and meditations upon such matters as why, in westerns, townships are never built on hills or rivers. But the book is a risky flight, and the late, great Captain Mark, while announcing our safe arrival, reminds us how fragile we are. The CLPE Poetry Award was set up in 2002 and was awarded for the first time in 2003. The award aims to honour excellence in poetry written for children. It is presented annually for a book of poetry published in the previous year. The judges of the award this year were Valerie Bloom, Roger McGough and Tony Mitton, with Margaret Meek Spencer as chair of the judges. The CLPE Poetry Award is administered by the Centre for Literacy in Primary Education, Webber Street, London SE1 8QW. It is supported in 2006 as in 2004 and 2005 by Mr and Mrs J.A.Pye�s Charitable Settlement. Australian profile of Anthony Browne. 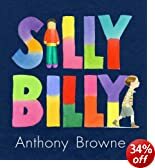 Silly Billy will be published in September. In the interests of balance, and since Winterson's publisher objected when I posted an extract from another criical review, I shall point out, for those who don't click the link to the full rview, that Jones also says - besides calling the book 'ramshackle and rambling' - "Some details are beautifully made." HAVANA -- Cuban librarians on Friday criticized attempts by the Miami-Dade County school board to ban a children's book because of its positive depiction of life on the communist-run island.